Male Stomach Fat - Get Rid Of It! If you are just now seeing yourself becoming more soft-looking, more flabby, and less muscular...you can put a stop to it. Stomach fat in men is directly linked to intense health risks like heart disease, Type II diabetes, Insulin resistance, liver disease, some forms of cancer, and Erectile Dysfunction. Now, more than ever before, we are seeing men under 40 on medication for these issues. Viagra sales are increasing each year. 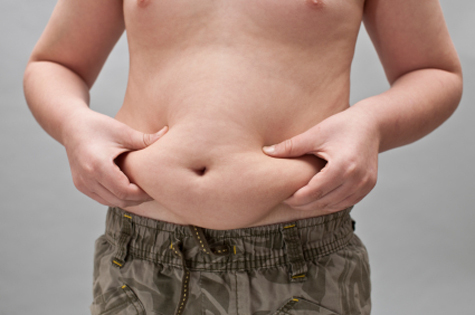 Male belly fat is now being termed as "dangerous." On a social level, women are not afraid to express their disgust with men who are overweight attempting to date them. They make it very clear that they have no use for guys with love handles or beer belly fat. Chicks are very adamant in desiring athletic guys with the Lean Hollywood Look. You do not need to endure either of these situations. Since you were searching for ways to get rid of stomach fat, I'll give you some simple old-school strategies. If you spend enough time on my site, you will know my basic, old-school strategy is: Eat Less - Eat Better - Exercise More. You can create a body that is very appealing to women if you can maintain focus on that 6-word workout plan. * To lose stomach fat, you must target your diet, regular exercise, and structured cardio. Of these three elements, Diet is the most important. * Sugar foods are OUT. All they do is create fat on your waist. Get rid or any food or snack with over 2g of sugar. * Be conscious of what you eat. This is what Olympic and professional athletes do. They know EXACTLY what they are putting in their mouth, and if that food will build lean muscle or be stored as belly fat. There can be NO MORE mindless eating. * Cut out junk food, cut out fats foods, cut out processed foods. * Each meal will now include a fruit, a vegetable, and a SOLID protein source like fish, turkey, or skinless chicken breasts. DO NOT start gulping protein shakes. * In order to accelerate the loss of male stomach fat, you will need to start a strength building program that includes weight training and cardio that includes interval training workouts. The strategy is simple: Eat Less - Eat Better - Exercise More. The trouble is, all of that flab came on easily, with no thought on your part. To get rid of it, and build lean muscle, will take both TIME and FOCUSED EFFORT. A lot of guys do not want it to be that difficult. The trouble is...that's Reality. * It is a progressive program that centers on making good food choices and using strength building workouts to increase metabolism naturally. * This is old-school all the way. There are NO expensive supplements to purchase. NO phony exercise equipment to buy. You will learn how to get rid of belly fat by making positive changes in your lifestyle. Less food, better food, more exercise. * Mike Geary's program has helped 1000's of guys lose fat to become more healthy and more appealing to women. * His program has eight levels of strength training workouts and eight levels of abdominal workouts. You progress as you become stronger. 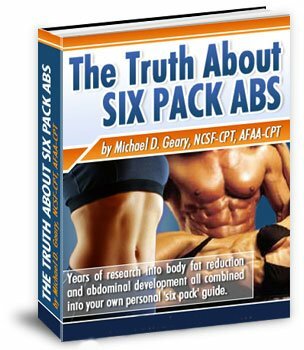 The Truth About Six Pack Abs is worth your investigation to help you lose male stomach fat and build a body women find attractive.